When is a dance company in fact not a dance company? When it is being run by a coven of witches with their own dark agenda. That’s probably the biggest takeaway after watching this unusual movie from director Luca Guadagnino, which is also a remake of the Dario Argento film from 1977. However, where the first film had a focus on grisly murders, this remake takes the art of dance and images and how that it could serve as a means of some very arcane magic. Set in 1977, an American dancer named Susie Bannion auditions for this prestigious dance company in Berlin and wins based on her raw talent. She catches the eye of the company’s artistic director, Madame Blanc (Tilda Swinton), who then starts to groom her to dance in a lead role that Blanc herself performed years earlier called Volk. However, there is more to the dancing than even Susie realizes. For starters, the “chorus” of dancers perform a specific choreography that could be considered an equivalent to geometric designs on the floor to perform witchcraft. Early on Susie is asked to perform in rehearsal the role of the protagonist from Volk, but already imbued with magical qualities the dance movements have a dreaded affect on a former student named Olga, almost as if it was some perverted form of sympathetic magic. Meanwhile a friend of Susie’s, another dancer named Sara, discovers some secret doorways and rooms in the building that houses their dance company, and in doing so stumbles across a dreaded secret that some of the Madames are involved in. However even they are in for a surprise as the table are turned on them by Susie herself, where she reveals that there is more to her than any of them had guessed. Having not seen the original 1977 film I found myself going into this movie completely “blind,” which is a shame because the original film was done by a protégé of Italian horror schlockmaster Mario Bava, and while I may not have seen the original, it is looked upon quite fondly by many cinephiles. The attraction for this film was the fact that it stars Tilda Swinton. What I was not expecting is the amount of time she spent on the screen. She has a great bit as Madame Blanc, the artistic director of this dance company, but she also played Dr. Jozef Klemperer, a psychiatrist who is treating one of the dancers of this company who has discovered that there is something rather “unnatural” going on within the studio. 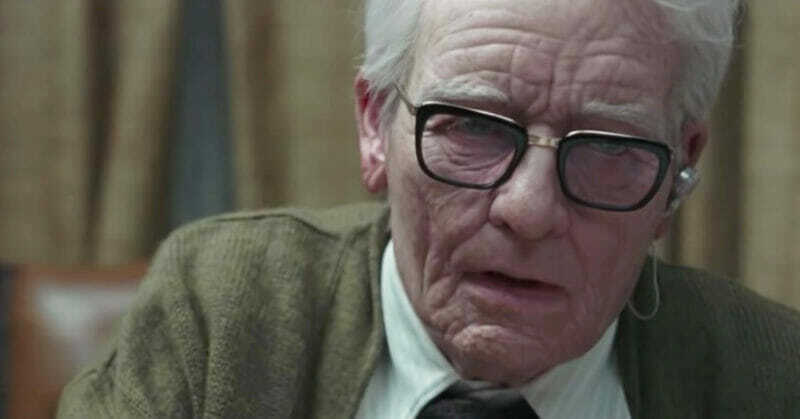 Dr. Klemperer is an elderly character and was alive during the days of World War II, and sadly lost his wife during that time. 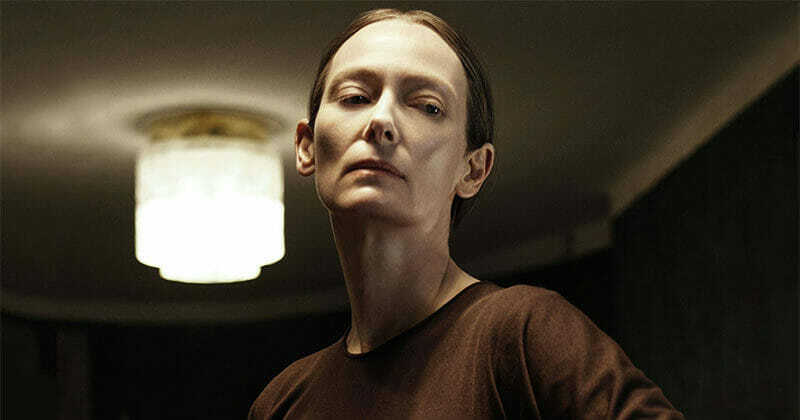 The only thing that betrayed Swinton in playing the part is her voice that she deliberately made gravely and pushed down to try to make it more masculine. Nonetheless, it was very entertaining to watch her take on this very different part. She also shows up briefly as a very evil, “motherly” character, but was completely unrecognizable underneath the tons of latex and makeup. However the part was so small (but significant) that there was not much opportunity to identify her in the role. However her best part is that of Madame Blanc. Her drive as a dance director, in addition to her hidden agenda, makes her a very compelling character. The other matrons of the dance company almost came off as stereotypes, especially given the setting in 1970’s Berlin to the point of becoming almost comically cliché. The only saving grace about that is their roles were mercifully small in comparison to others. We then come to Dakota Johnson as Susie Banion, probably one of the most confusing of characters in this movie. Appearing as meek, but passionate about dancing, her character comes from a Mennonite family that also appears to be harboring a secret in regards to Susie. Flashbacks show her as violently punished to the point of horrific child abuse, and much of that is chalked up to the family situation she lives in. Now as an adult in the dance company, Susie simply comes off as wanting to please Madame Blanc and be the best dancer possible. It isn’t until the final “act” that we learn who she really is, but there is nothing in her character development to even hint at her true nature. Even in the epilogue of the film there is nothing there that sets her apart from what we see at the beginning of the movie. There are virtually no character developments with anyone. Each one is remarkably static, which makes for absolutely nothing character driven here. On the other hand, this movie is all about visuals. Director Guadagnino chooses to focus his energy on creating some amazing, and at times violently graphic, images. Early on in the film one of the dancers, a young woman named Olga, gets very ugly with Madame Blanc and storms out after some pretty harsh insults and accusations. In one of the most horrific displays of retribution Blanc uses Susie’s dancing as a means of “breaking” Olga. It was here that I actually found myself cringing as this is played out for several minutes. This is the first true moment of real horror in the movie, and there is nothing subtle or gradual about it. When it happens it is immediate and intense. However, with all of its violence the scene is wildly compelling given that it was shot in a dance room surrounded by mirrors, and the only reflection ever caught is that of Olga. At no time do we see a camera, any special lighting rigs, or even a camera operator. The technical skill in filming this scene is absolutely amazing, only to be exceeded by the scene’s intensity. Then there is the building where this dance company is housed. It’s a big building filled with wonderful angles and curves, as well as a beautiful spiral like staircase that begs for those expected shots that were either straight up or down. As cliché as those types of shots can be, the way it is played here helped to create a sense of unease, especially early on when the story itself doesn’t suggest anything nefarious happening. The last scene in the final act of the movie then delivers one of those moments that pays tribute to the schlockmasters of the past with gushing blood everywhere. It’s typical horror, but is so insanely over the top that it comes off as more artistic than horror filled. This film is less a remake and more of an homage to the 1977 movie, so any comparisons to the original movie is rather pointless. The supernatural element is a bit confusing, but any viewer intently thinking about what is happening might arrive to an accurate conclusion about where the movie is going. While there are some who might find that type of experience rewarding, others might come away feeling the storyline as murky. 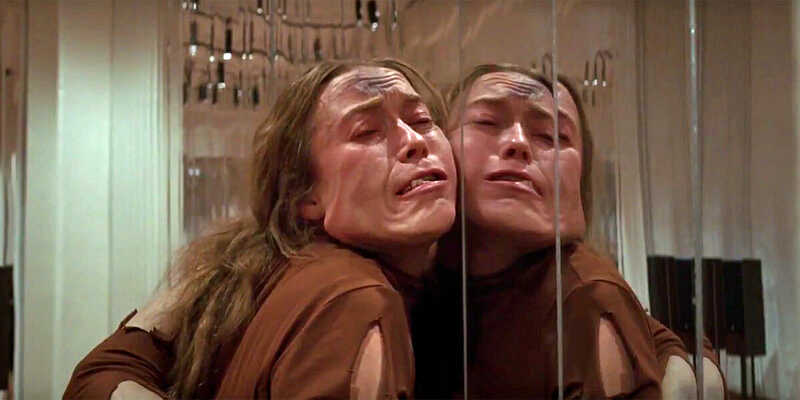 The movie is also comprised of six scenes that feel as if each were written and directed by someone different, making for a very disjointed experience. In short, if Suspiria were to be evaluated purely as a horror film I could only give it 2.5 out of 5 stars. 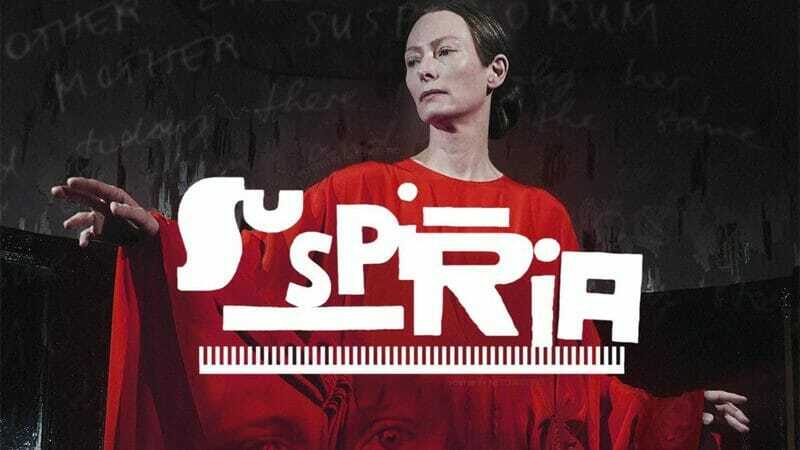 However, if I were to rate Suspiria as an art film based on cinematography and art direction, then I would give 4.5 out of 5 stars. As a simple horror movie it is somewhat poor, but as an art film and judged by the visuals, cinematography, and even production values, the movie is a pure triumph. Your thoughts and opinions are important to us, so please leave a comment in the section below the article, and if this is your first time visiting please be sure to read the Privacy / Terms and Conditions Of Use.